I have signed up to do the Art Journal Every Day. There is a blog link Here. This is my first page. I am aiming to do about a page a week and spend just 10 minutes a day on my journal. I can glue a background or add a few lines to a ready started page. 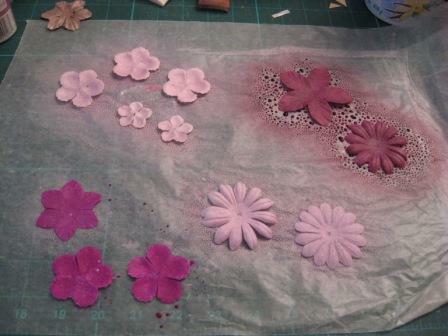 Spray painted paper flowers. I hope to use a few of these in the coming weeks. This took more like one hour as my spray bottles were plugged up and I sent time cleaning and finding out which worked or did not work. Some of the mister are just no good. I think I will stop buying spray mister and make my own colours with paint and a mini mister and glitter dust. I have all kinds of colours. 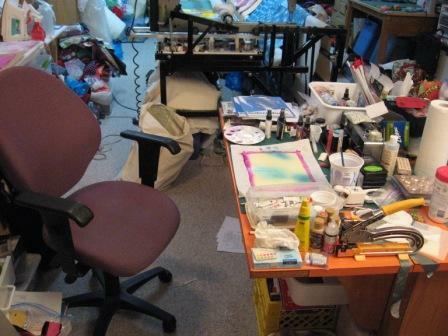 Here is my work space. I am planning to work on one end of my big orange sewing table. I sometimes use this space to cut fabric. With a little cleaning I can cut fabric here. Total gorgeousness! Love seeing your space! 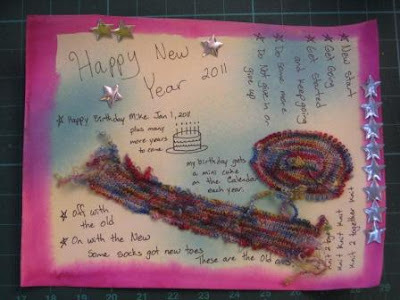 And I'm delighted that you're participating in Art Journal Every Day!